This latest in Anglican Press Australia’s series of “Studies for Lent and Other Times” is an outstanding addition to the genre. It is usually quite difficult to sustain the quality of brief meditations or explanations covering over 40 different Bible passages. Reg Piper achieves this by the selection and ordering of the biblical material as much as by his clear and straightforward comments on each. The Life & Labours of Paul: Insights from Acts and the New Testament Letters is intended to enable the reader to grow spiritually by reflecting on how God shaped Paul as an apostle and how Paul expounded God’s love in his ministry and letters. The book gives a suggested reading from the New Testament, a short comment and a relevant prayer for each of 40 days, plus seven sermon outlines and discussion questions appropriate for use at various stages in the series. 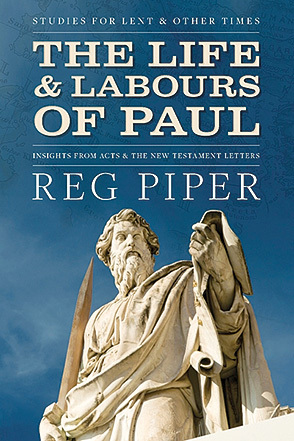 Bishop Piper lays out relevant readings from Paul’s letters and Acts in a sequence that illustrates Paul’s life from his early years to his final ministry and martyrdom. This process must, as Piper happily admits, involve some conjecture and probable historical reconstruction as the available material can be quite patchy – especially around the early and later parts of Paul’s life outside the period dealt with by Acts. Even Acts is quite uneven in its coverage when it does deal with Paul. For example, the 14 years of Paul’s ministry in Syria and Cilicia straight after his conversion as mentioned in Galatians (1.12ff) are completely missing in Acts 9. Rather than argue his own case, Piper is content to be guided in these matters by two eminent Pauline scholars, F.F. Bruce and our own Bishop Paul Barnett. The result is that reading portions from Acts and Paul’s letters in the order Piper gives us is quite an illuminating experience. We learn more that we might have first thought about Paul and his ministry and relationships. This would be very helpful to readers who have never actually put the Pauline material in the New Testament together into a coherent whole. An attractive human story of Paul the man emerges, which is, as Piper intends, an encouraging picture. The comments on each passage together with the suggested prayers are clear and straightforward. Piper presents a classic picture of Paul’s thought and ministry and does not interact with any of the more recent scholarly discussions in the area. This may be applauded by some, although I wonder if more on how Paul saw himself completing Israel’s story in his ministry through his frequent echoes of Scripture might have deepened the picture Piper presents. As it stands, this accessible, warm and encouraging short volume (110 pages) would be an excellent basis for a personal or parish study program on Paul and thus a significant part of the whole New Testament. Highly recommended.